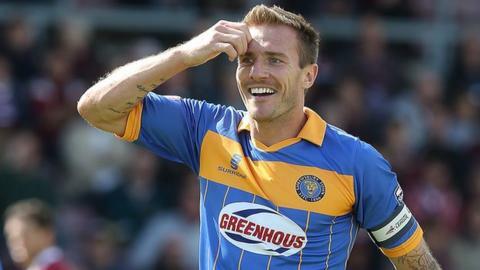 Goals from Liam Lawrence and Scott Vernon maintained Shrewsbury Town's unbeaten home record in League Two to keep them top of the table. AFC Wimbledon were hampered by the loss of goalkeeper James Shea, who was stretchered off in the 23rd minute and replaced by youngster Joe McDonnell. The 20-year-old debutant was beaten in first-half stoppage time when Lawrence drilled the ball home from 12 yards. Vernon then headed his first league goal of the season to seal the points. Shrewsbury still boast the best home record in the country, having won 13 of their 16 league games, conceding just six goals. Micky Mellon's men remain top only on goal difference from Burton Albion, who also enjoyed a 2-0 home win, against Oxford United. "I'm very pleased. It's another hard-fought game against a team who came here with a very clear game plan. They tried to frustrate us and did that at times. "There is never a perfect time to score - but it was certainly good to get in at half time one up. We got balls into the key areas and put Wimbledon under immense pressure. "I am very pleased with our professionalism, as there was a lot of hard work, but we want more. This isn't my poker face. It makes no difference what other sides have done. We remain focused on what we need to do." "In the first 15 minutes we didn't pass it well enough and didn't have enough quality about us, but we grew into the game. "In the first half it was our decision making when we got in great areas. The final pass wasn't good enough. "in the second half we started bright and then you concede from a set-piece which we haven't done lately. That's hard to take." Match ends, Shrewsbury Town 2, AFC Wimbledon 0. Second Half ends, Shrewsbury Town 2, AFC Wimbledon 0. Corner, Shrewsbury Town. Conceded by Adedeji Oshilaja. Attempt blocked. Bobby Grant (Shrewsbury Town) right footed shot from the right side of the box is blocked. Callum Kennedy (AFC Wimbledon) wins a free kick in the attacking half. Attempt saved. James Collins (Shrewsbury Town) right footed shot from the centre of the box is saved in the bottom left corner. Attempt missed. James Collins (Shrewsbury Town) left footed shot from the centre of the box is close, but misses to the right. Substitution, Shrewsbury Town. Bobby Grant replaces Liam Lawrence. Substitution, Shrewsbury Town. Connor Randall replaces Jermaine Grandison. Corner, Shrewsbury Town. Conceded by Barry Fuller. Corner, AFC Wimbledon. Conceded by Connor Goldson. Adedeji Oshilaja (AFC Wimbledon) wins a free kick in the attacking half. Dave Winfield (AFC Wimbledon) is shown the yellow card. James Collins (Shrewsbury Town) wins a free kick on the right wing. Foul by Dave Winfield (AFC Wimbledon). Attempt blocked. James Collins (Shrewsbury Town) right footed shot from the left side of the box is blocked. Jermaine Grandison (Shrewsbury Town) wins a free kick in the attacking half. Jake Reeves (AFC Wimbledon) wins a free kick in the defensive half. Attempt missed. Adebayo Akinfenwa (AFC Wimbledon) header from the centre of the box misses to the left. Attempt missed. Jordan Clark (Shrewsbury Town) right footed shot from the centre of the box misses to the right. Attempt missed. Liam Lawrence (Shrewsbury Town) left footed shot from the centre of the box is high and wide to the left. Attempt missed. George Francomb (AFC Wimbledon) right footed shot from outside the box misses to the left. Attempt missed. Jake Reeves (AFC Wimbledon) right footed shot from outside the box is close, but misses to the right. Substitution, Shrewsbury Town. Jean-Louis Akpa-Akpro replaces Tyrone Barnett. Attempt saved. Tyrone Barnett (Shrewsbury Town) header from the centre of the box is saved in the centre of the goal. Substitution, AFC Wimbledon. Sean Rigg replaces David Connolly. Ryan Woods (Shrewsbury Town) wins a free kick in the defensive half. Substitution, AFC Wimbledon. Adebayo Akinfenwa replaces Adebayo Azeez. Attempt blocked. Scott Vernon (Shrewsbury Town) right footed shot from outside the box is blocked. Corner, AFC Wimbledon. Conceded by Jayson Leutwiler. Attempt saved. Adebayo Azeez (AFC Wimbledon) right footed shot from the right side of the box is saved in the top right corner. Jordan Clark (Shrewsbury Town) wins a free kick in the defensive half. Foul by Adedeji Oshilaja (AFC Wimbledon).